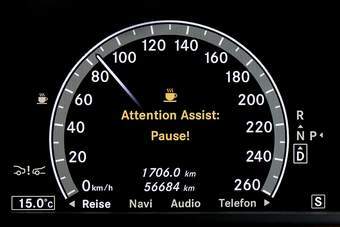 Attention Assist, a sophisticated drowsy-driver detection system, is now standard equipment - as long as you're buying a new E-class Mercedes-Benz sedan. Mercedes-Benz engineers proved their worth by testing almost 600 drivers, using electrode-studded skullcaps to determine sleepiness. In the end, they asked for just one new mechanical part: a more accurate steering sensor. Mercedes claims its system is an independent judge of fatigue, constantly monitoring a driver’s behavior to send warning chimes and flare a coffee-cup sign when it senses a serious drop-off in alertness levels. This drowsy-driver detection system is considered futuristic - and yet it is the exact opposite of the feature offered in the Camden speedster from Robert Heinlein's 1941 classic Methuselah's Children. From No Doze: Mercedes E-Class alerts drowsy drivers via engadget.